Extracting elements from films such as [Rec] (2007) and Kairo (2001), Antisocial seeks to hack into both the dwindling zombie craze and a body of other Interwebz paranoia flicks (think The Net (1995)). 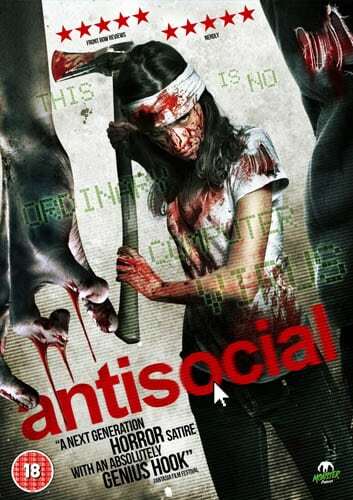 Unfortunately for writer/director Cody Calahan, Antisocial has arrived on the horror scene a decade too late. In itself, that is not enough to condemn the film entirely: had the movie been well executed, its tired premise would have been perfectly acceptable (or at least forgivable). Unfortunately the film itself is as scary as a plastic dog turd, and its "commentary" on social media is as subtle as a real dog turd. In sum, Antisocial is the horror equivalent of the pamphlet-turned-"TV movie" Cyberbully (2011), and that is hardly a recommendation.